Better late than never. We posted a great file of from Tina's victory at this season's USA Cycling Criterium Championships on the TrainingPeaks blog yesterday. This was Tina's fifth national criterium championship title! Amazing. The numbers aren't off the charts but that is mainly due to the wet and dangerous conditions. Goes to show you raw numbers are not always what win in the end. Staying upright and sure footed are #1 in dangerous conditions. Thanks Tina for the file and interview. Here is portion of his November 19th blog..
Comme tout bon adepte du power meter, j'ai investi dans le logiciel WKO+ de cyclingpeaks. C'est une mine d'or, fiable et stable, qui permet entre autres de juger de son état de forme à un instant donné, en utilisant une notion que Coggan appelle le TSB (Training Stress Balance). Ce TSB est calculé à partir des watts que je suis sensé avoir produit sur un entraînement, cumulé sur plusieurs semaines, avec une moyenne mobile à 7 et 42 jours. Le but est d'obtenir un cumul d'entraînement important (CTL), mais en se réservant une période d'affûtage les derniers jours avant un objectif afin de rendre le TSB acceptable pour une bonne perf. Tout ceci est remarquablement quantifié et statistiquement prouvé, d'autant plus que les constantes des moyennes mobiles (donc de la période d'affûtage), peuvent êtres changées d'un athlète à l'autre. Ce graphique célèbre pour avoir fait l'objet de nombreuses conférences, s'appelle le PMC (Performance Management Chart), reprenant visuellement les courbes de progression de l'athlète. Here is a video of a mass crash at this year's Giro d'Italia. This is stage 11 and as you can tell the road was as slick as ice. It's amazing there wasn't a mass pile up. Situations like this make me glad I'm not a pro rider anymore and don't have to ride in the rain if I don't want to. What a difference a year makes. Last November by this time we had already shoveled more than 20 inches of snow here in Boulder. Now a year later we haven't even touched a snow shovel and as reported in last week's blog, flip flops and shorts are still in fashion. I figured I better take advantage of this amazing 70 degree weather and get out on the bike as much as possible. I'll have plenty of time to hike, run and ski once the snow starts flying (maybe tomorrow!). So, today I headed out for an amazing 4hr workout on the cross bike in the mountains. In addition I made arrangements to meet up with my wife and daughter for a mid-ride hike in the back country. It is always a joy to meet the family up at a trail head and swap the cycling cleats for hiking kicks and hit the trails with my two favorite girls. If you know Boulder at all you'll know the route I took today wasn't the easiest. Very few riders have probably ever pondered riding the 2,300ft climb up Lee Hill to the top of Deer Trail road, but it is a staple of my training regime since it is a solid one-hour climb at 300+watts. Once at the top the road turns to dirt and a mountain bike is the best choice to make the connection down to Sunshine Canyon. However, I like to push the limits on the cross bike so it a good thing I don't cherish my wheels. Besides a little wobble here and there is character building I say. I've also added the biggest, nastiest cross tires I could find (Redline Kross Supreme, 700 x35, see below). These Kross Supremes are also ideal for snow conditions and act like snow shoes when the white stuff piles up. 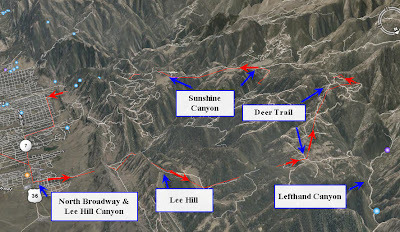 The route from the top of Deer Trail to Sunshine is one nasty single track with loose rock and steep pitches on the upper part. It is a short segment however and then it's onto silky smooth dirt roads. Today I met my family where the road ends and single track picks up. The route we hiked was an old miners route which drops about 1200ft in 1.5 miles down to the small town of Rowena. Rowena is just a gathering of about a half dozen homes in Lefthand Canyon on the way to Ward. Most Boulder cyclists have been through Rowena on their way up the popular ride between Boulder and Ward. 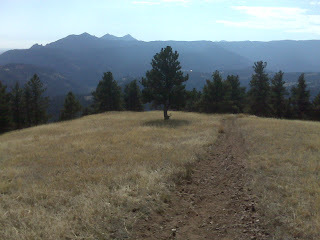 After an hour easy hike with my girls I slipped the cycling cleats back on and traversed down Sunshine Canyon to Boulder. Another Sunday has passed and this one was one to remember. The Flemish are Coming..The Flemish are Coming!!! Euro cross fans have waited since last November to see a UCI-cross race hit the 5,000ft altitude barrier. However, the majority of Flemish fans were probably actually hanging out in Boulder Creek during the races cooling off from the high altitude heat wave. Temperatures hit 75F (let's see what is that in Celsius? subtract 30 and divide by 2..so @ 23C) causing the beer to flow warm up in the beer garden. The Boulder Cup cyclocross race probably wouldn't qualify as a cross race in the Belgian heartland since there was not cup full of mud, water or cow manure to be traversed. The attire of the day for cross fans was shorts, flip-flops and a picnic blanket, no galoshes needed. Who's complaining though? I'd rather get a tan and watch cross that frozen toes. Besides the warm weather the race course was incredible to be a spectator at since it allows the fan to see about 80% of the race from almost anywhere on the course. The Boulder Cup is held at the Harlow Platts Park in south Boulder and it reminds me of the Cross Vegas course which is held at a soccer pavilion. The majority of the racing is on pristine grass with a stretch of pavement and sand thrown in for variety. The park also had a nice hill which the riders traversed three times each lap. This years elite event had little strategy involved since Ryan Trebon pretty much walked away with the title from lap two of eleven. A chasing duet of Tim Johnson and Jeremy Powers couldn't close the gap allowing Trebon to single handedly walk away with an amazing victory by show of force. Once the top three positions were sorted out the action seemed to shift to who would be fourth through sixth place between Barry Wicks, Pro-roadie/tour de France rider Chris Horner and Geoff Kabush. Horner put on a show by rocketing up through the field the first half of the race and making the pro cross guys earn their keep. Horner, with his hands in the drops and out of the saddle style, looked more like he was leading out Robbie McEwen for a sprint than racing a UCI Cyclocross event. It is pretty amazing how a guy like Horner can race from February to mid-October in Europe and finish top 30 in the Tour and top-10 in the last Classic of the year in Italy and then come right out into cyclocross racing with a top 5 result. Instead of racing cyclocross most guys would be nursing a dried up pituitary gland if they raced than many miles at the Pro Tour level. Horner has proven time and again he is the work horse of the peleton and earns every Euro he gets. Ryan Trebon slams the competition.